People working to stop executions in Texas will spend the day on Wednesday, March 16, lobbying Texas legislators during the “Day of Innocence” and Statewide Texas Lobby Day Against the Death Penalty. Register online. Special guests on the “Day of Innocence” include six death row exonerees who together spent almost 50 years on death row for crimes they did not commit: Anthony Graves, Clarence Brandley, Shujaa Graham, Ron Keine, Gary Drinkard and Albert Burrell. “It is time for the Texas Legislature to pass reforms that will protect innocent people from the injustice of wrongful convictions and to stop executions with a moratorium on executions. Participants in the Lobby Day will also advocate for the two bills filed to abolish the death penalty or any death penalty related bill that is important to them, such as the bill requiring separate trials in death penalty cases or the Law of Parties bill”, said Scott Cobb, president of Texas Moratorium Network. People interested in participating in the Lobby Day can register online. Registration is not mandatory, but it helps organizers schedule appointments with legislators. The “Day of Innocence” will be a day we will always remember, a day when we stood side by side fighting against the death penalty with people who were wrongfully convicted and sentenced to death. Don’t be one of those people who one day “shall think themselves accurs’d they were not here” and fought with us on the Day of Innocence”, said Cobb. The “Day of Innocence” on March 16 will conclude with a rally at 5:30 PM on the South Steps of the Capitol. 8 :00 – 9:00 AM Check-in and Meet and Greet at the Texas Capitol in room E2.026. Legislators, staff members, everyone coming to Austin for the Lobby Day and anyone at the capitol and the general public is welcome to attend and meet death row exonerees Anthony Graves, Clarence Brandley, Shujaa Graham, Ron Keine, Gary Drinkard and Albert Burrell who all spent many years on death row for crimes they did not commit. 9 – 10 AM Lobby Training. People coming for Lobby Day will be trained and given assignments. People who received training before Lobby Day can begin lobbying. Location: Room E2.026 in the Texas Capitol. Sometime during the day while the House and Senate are in session the death row exonerees may be recognized and honored with a resolution in the Texas House and/or Senate. 10 AM – Noon Visit legislative offices to lobby legislators and their staff. Noon – 1 PM Lunch on your own. There is a cafeteria in the Texas Capitol. 1 – 2 PM Press conference and group photo in Texas House Speaker’s Committee Room 2W.6 at Texas Capitol with death row exonerees and others. 2 – 3 More lobbying visits to legislative offices. 3:00 – 4:30 PM Panel Discussion on “Innocence and the Death Penalty” with six death row exonerees, Location: room E2.026 in the Texas Capitol. Panelists and guests include exonerees Anthony Graves, Clarence Brandley, Shujaa Graham, Ron Keine, Gary Drinkard and Albert Burrell who are all innocent people who spent many years on death row for crimes they did not commit. 4:30:- 5:00 Set up for rally and final legislative office visits. 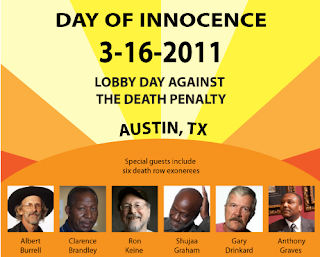 5:30 – 7:00 “Day of Innocence” Statewide Rally Against the Death Penalty on the South Steps of the Texas Capitol. Rally Speakers and other special guests include death row exonerees Anthony Graves, Clarence Brandley, Shujaa Graham, Ron Keine, Gary Drinkard and Albert Burrell. Lobby Day has been organized since 2003 by several organizations working together, the same ones who also organize the annual “March to Abolish the Death Penalty” each October: Texas Moratorium Network, Texas Death Penalty Abolition Movement, Campaign to End the Death Penalty – Austin chapter, Texas Students Against the Death Penalty. Organizations that would like to participate or co-sponsor the Lobby Day can email admin@texasmoratorium.org or call 512-961-6389.